One of my favorite kitchen tools for easy and delicious food is my crockpot. I use it several times a week for entrees, desserts, side dishes - any and everything! In fact, the summer it just stays out on my counter because I use it so often to avoid heating up the kitchen with my oven. So, with all that use and abuse how does one keep that crockpot clean and ready for the next recipe? Here are some tips for cleaning even the crustiest of crockpots! 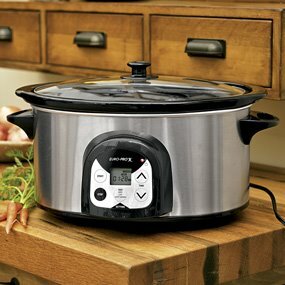 To prevent damage to the ceramic crock, allow the slow cooker to completely cool before adding water to clean. If you�re in a hurry and need to clean it right away, make sure to use warm/hot water instead of cool water to protect the crock from cracking. 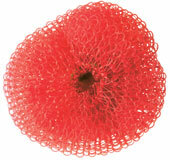 Use a nylon scrubber to protect the crock from being damaged with scratches. Fill crockpot with warm water and a squirt of liquid dish detergent. Allow to soak for about an hour before scrubbing it clean. You can soak overnight if the crock is especially crusty. Fill crockpot with warm water then add 2 or 3 denture tablets. Let soak overnight. Fill crockpot 1/4 full with vinegar, then add warm water to cover the stain line. Let soak overnight with temperature on low. In the morning scrub with a nylon scrubber and hot soapy water. This method is also helpful for removing sauce stains (tomato based sauces can discolor the crock, this helps remove them). Soak crock in warm water and baking soda before scrubbing for easier cleanup. Make a paste from baking soda and water, apply to stain and let set for a few hours. Spritz with water then scrub the paste to remove the stains. This also help remove sauce stains. Line the slow cooker with a foil liner or a roasting bag before adding recipe ingredients. Not very environmentally friendly since the liner is tossed after each use. Spray a bit of non-stick cooking spray around the inside of the crock before adding food items. Will help prevent food sticking.